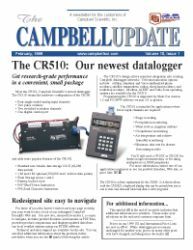 CSI has recently released its own shaft encoder, the CS410. This encoder uses "silver-in-glass" technology to convert shaft rotation into two pulse strings that can be measured by a datalogger. CS420 Druck’s submersible pressure transducer has a titanium body, a static accuracy of ±0.1% FS, is available in many psig ranges, and has vented polyurethane cable for barometric pres­sure compensation. CS510 Oxyguard’s dissolved oxygen probe is a self-polarizing galvanic probe that provides automatic temperature com­pensation. CSIM11 Innovative Sensors’ pH probe has a pre-amplified signal, does not re­quire an interface, and operates over the full pH range. An ORP version is also available.